Street protests, against plans to step up land privatisation, were broken up by police in many of Kazakhstan’s largest cities on Saturday. The demonstrations were organised by informal on-line networks, rather than by any of the recognised opposition groups. Here are key points from a report by ANDREI GRISHIN, published here on the Fergana news site (in Russian). Special rapid-reaction police detachments attacked small groups [of demonstrators] wherever they gathered. They grabbed everyone, regardless of gender, age and nationality. Dozens of journalists were arrested. Kazakhstan had waited for the events of 21 May with bated breath. [Protesters had named that as a day of action after a previous wave of demonstrations had forced the government to pull back from planned land reforms.] The official media had railed against the protests. And it all ended – grgrgkazza3as it has so many times before – with the “slaughter of the innocents”, but this time more brutal than usual. The detention of dozens of journalists, including foreigners, was proof of that. However, for the first time, people came out to protest all at once, in a number of cities and towns, without any leaders – because these leaders had either been arrested in advance, or had agreed to the authorities’ demands [after the previous demonstrations] and joined the [government’s] land commission. In any case, no revolution took place! The president of the administrative policing committee at the ministry of internal affairs, Igor Lepekha, announced on Saturday that there had been “no unsanctioned gatherings or conflicts with the police. No breaches of order were permitted.” But at the same time he confirmed the detention of a number of people, including journalists; there had been a “misunderstanding” with the latter, he said. Nevertheless, even this small number of demonstrations was a new phenomenon in Kazakhstan, in the sense that they started simultaneously in different regions. And all the experts noted in chorus that the land question was just the pretext, that in fact people have all sorts of other issues with the government. And that is really worrying parliament – above all, the fact that people are openly, and quite legally, calling for the resignation of the president. And so it was clear that the government once again would deal with the problem [of protest] with repression. Evidence of this was the series of criminal cases opened even before 21 May against civil society activists, and the announcement by the internal affairs department of western Kazakhstan about “preventing mass disorder”. And it is still possible, of course, that the Alma-ata police will “find” the owners of the molotov cocktails and sticks [i.e. use frame-up tactics against militants]. 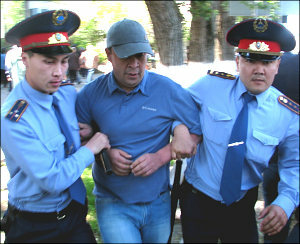 However at the same time the authorities have treated the land question with great caution – thus the one-year moratorium [announced by president Nazarbayev on 6 May] on the amendments [to the land code], and the establishment of the land commission, and inclusion in it of several “disloyal” grgrgkazza1civil society activists… and the hints that have been dropped about the possibility that each citizen of the country could be granted by law 1000 square metres of free land. Just a few days ago, when the government feared the spread of mass action, president Nazarbayev appealed to Kazakhs “not to shame ourselves before the world, but to solve our complicated problems by means of constructive dialogue”. Despite this talk of “constructive dialogue” from the president, the police special detachments hid firearms in their buses on Saturday. Whether they had plastic bullets, tear gas or live ammunition we don’t know. But thankfully they didn’t open fire on the crowds: bearing in mind the events at Zhanaozen and Shetpe [in December 2011, when police fired on a crowd of striking oil workers, killing at least 16 and wounding at least 60], it seems there was enough sense at the top to order that there be no repeat of that. 25 May 2016. Translated by People and Nature.